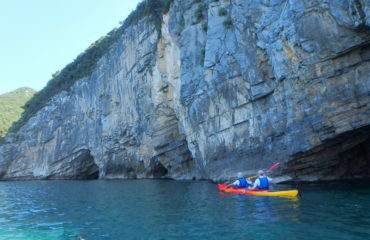 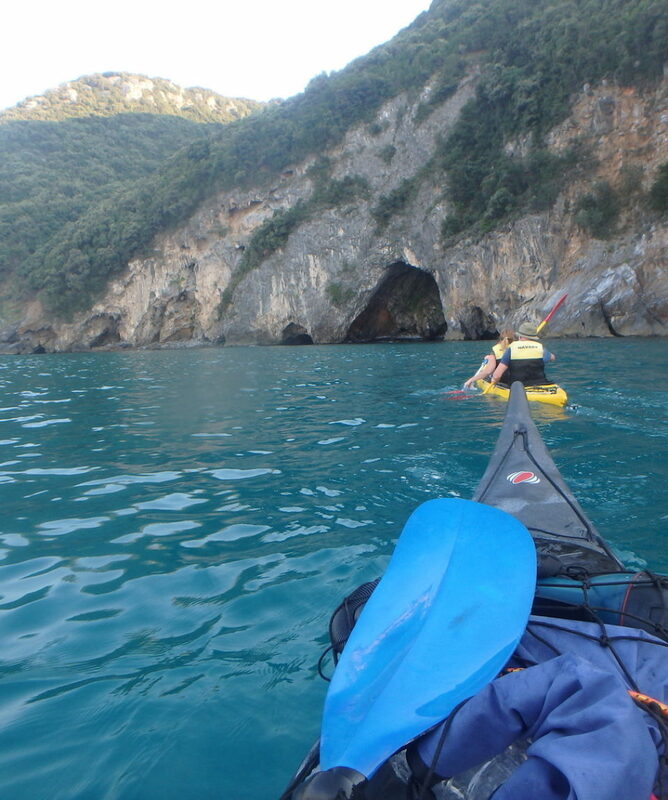 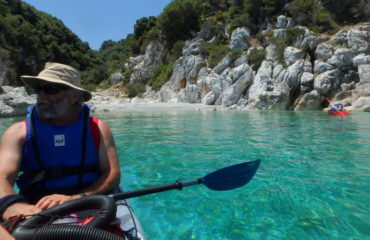 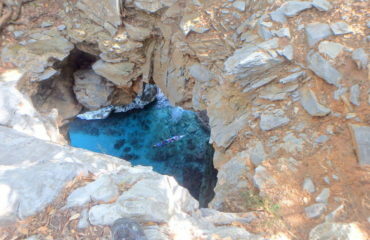 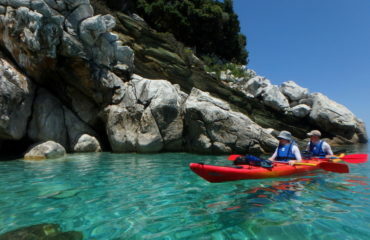 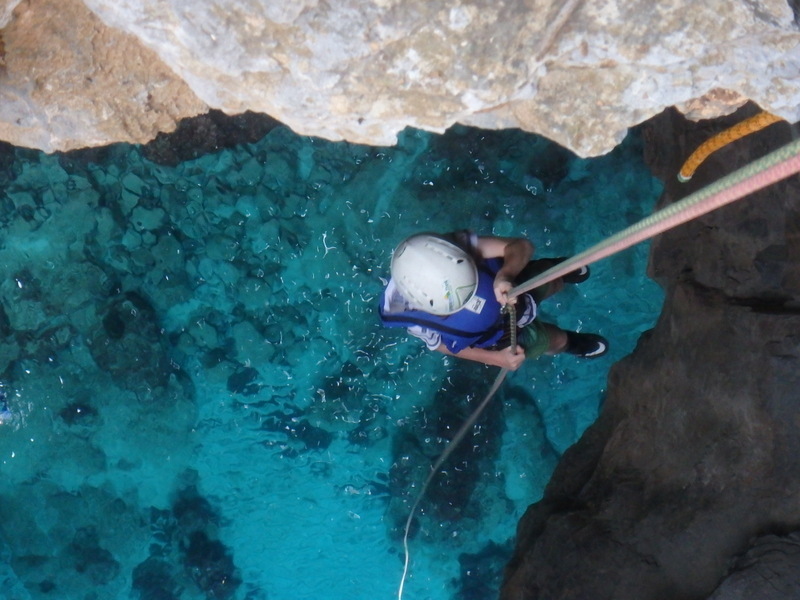 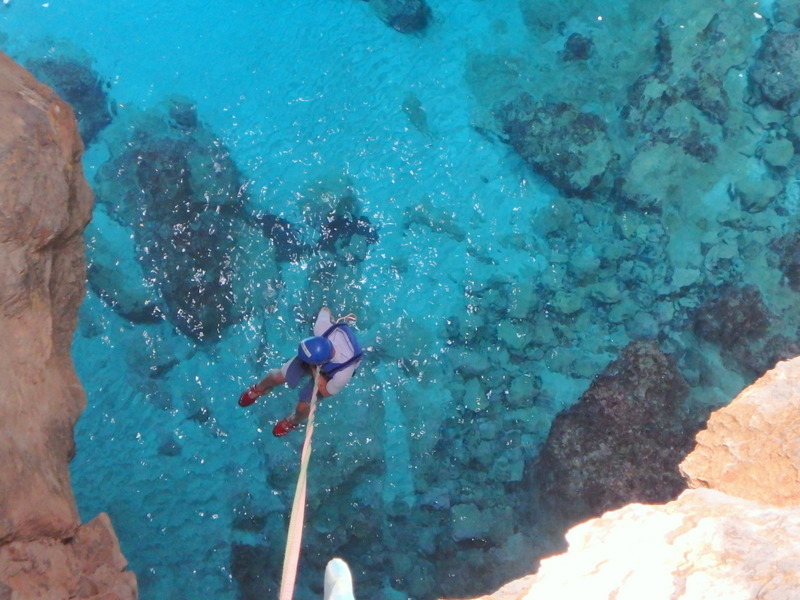 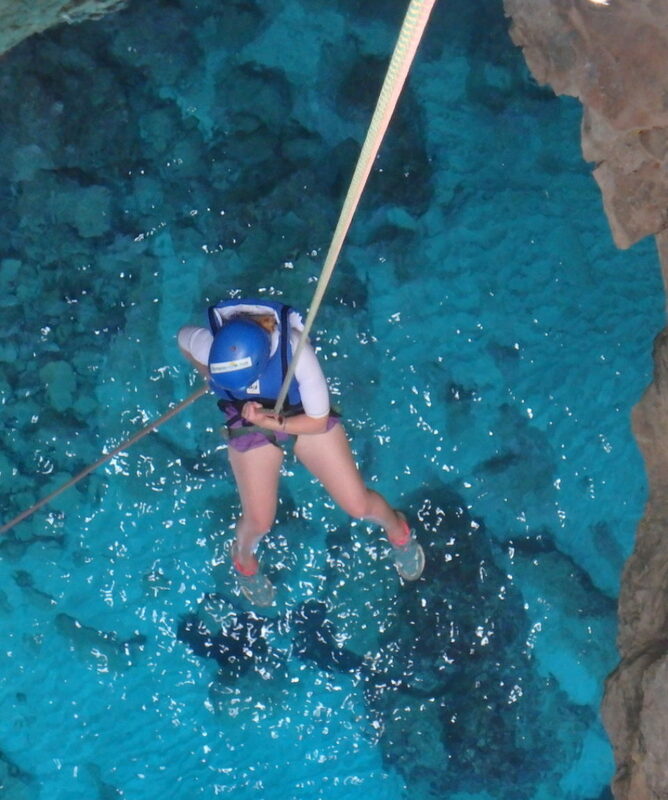 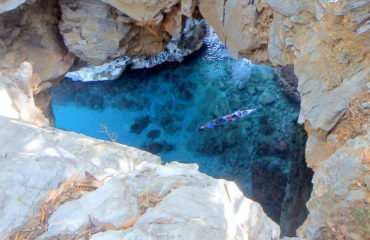 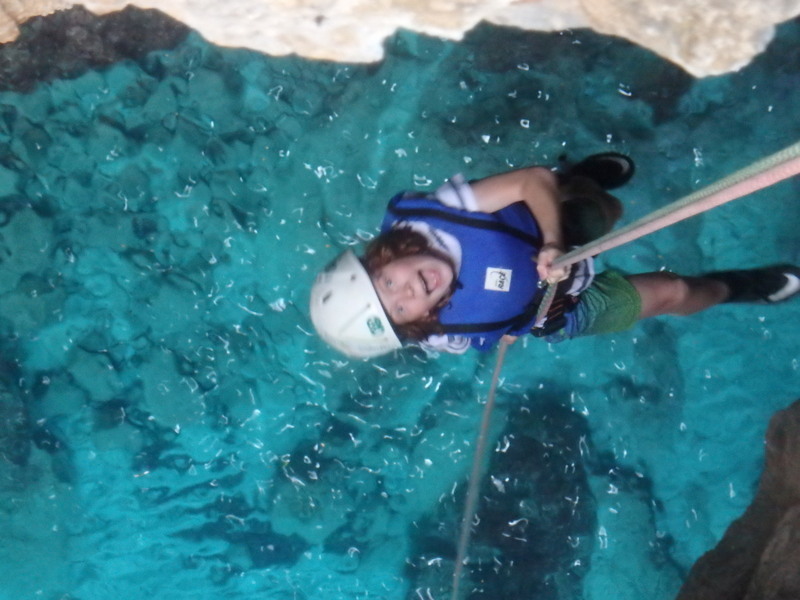 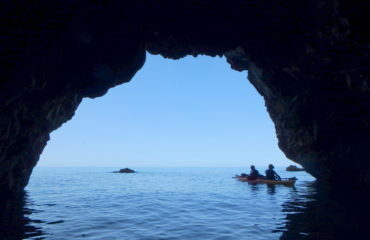 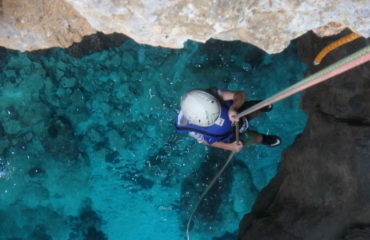 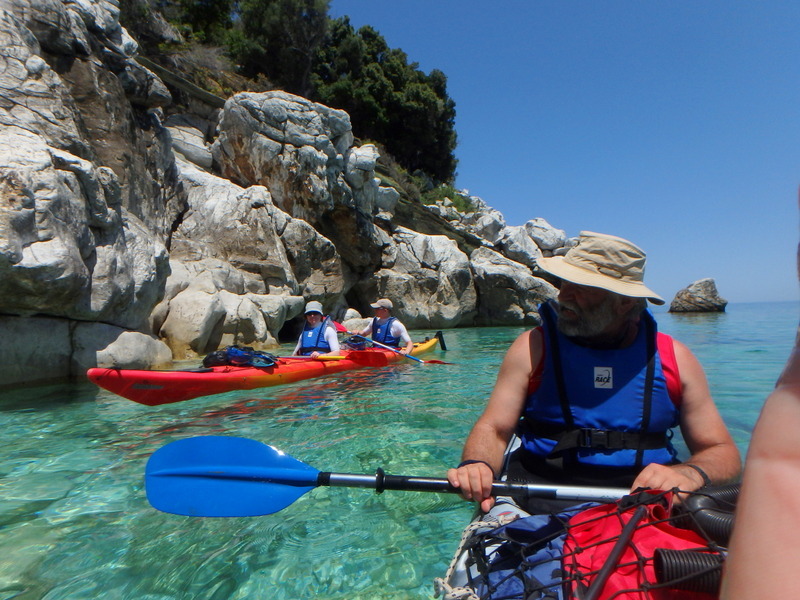 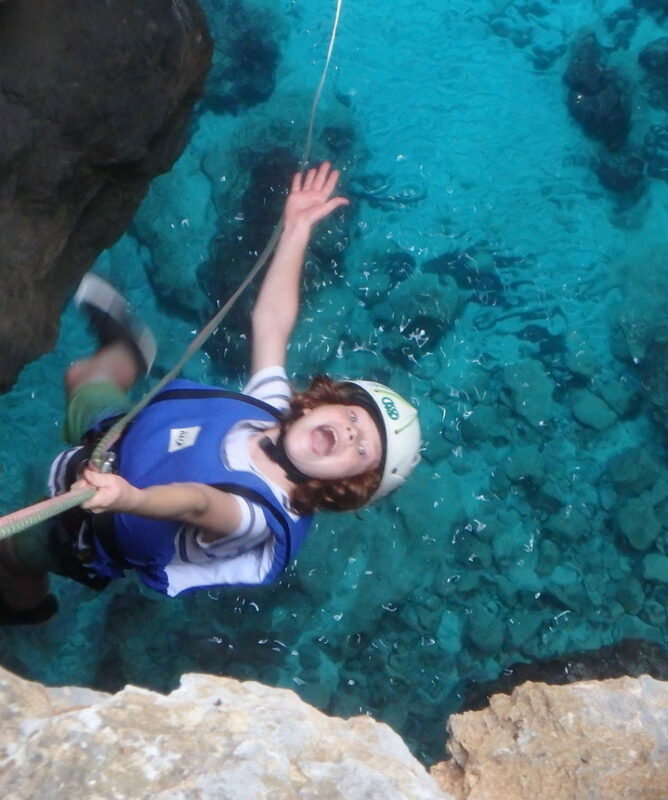 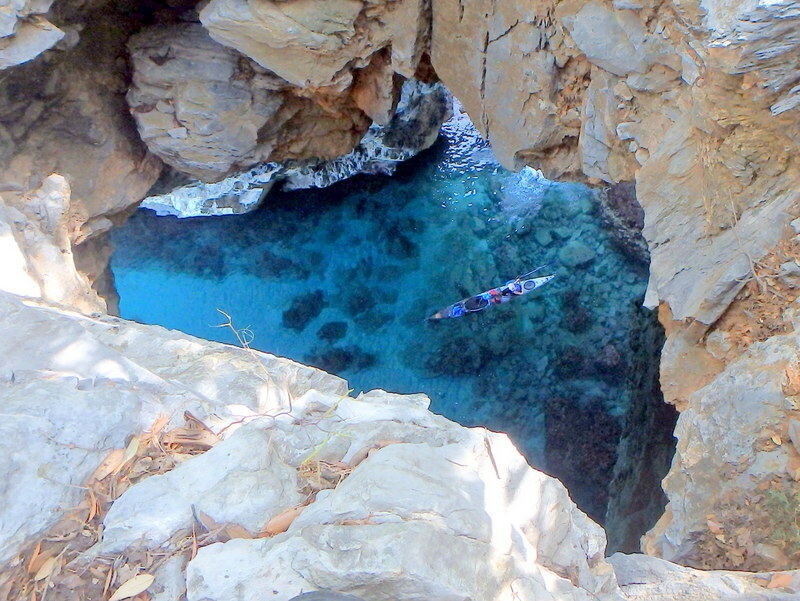 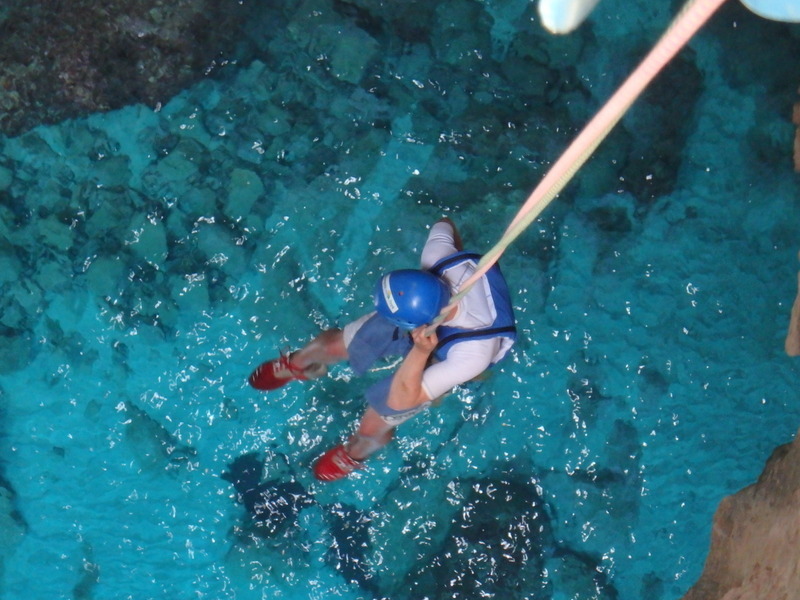 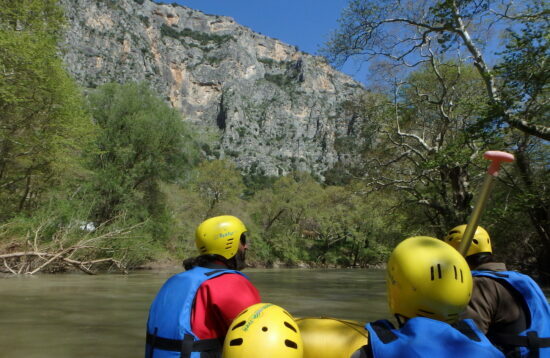 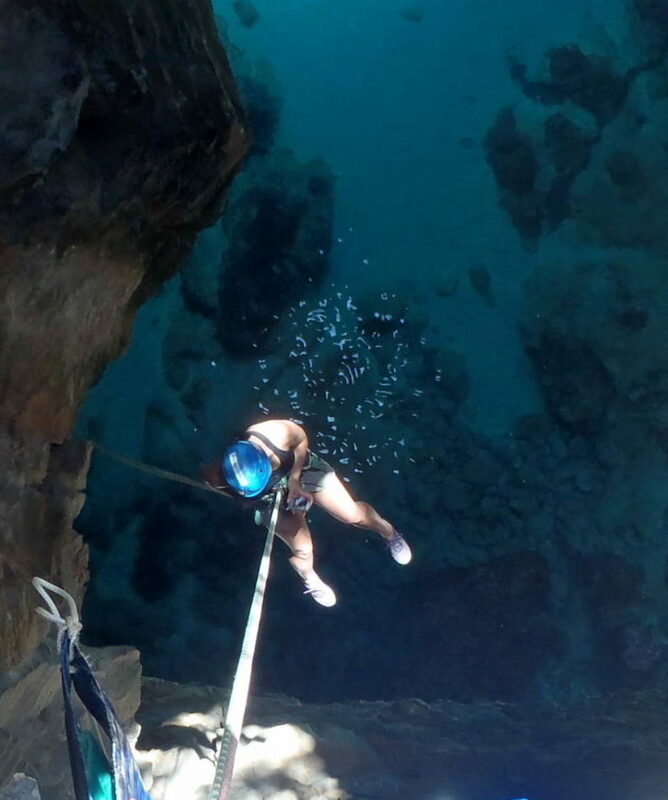 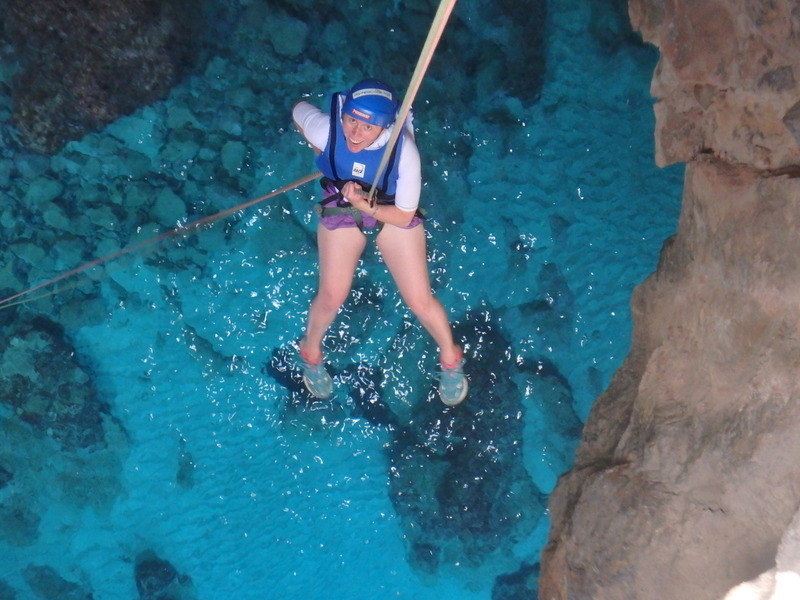 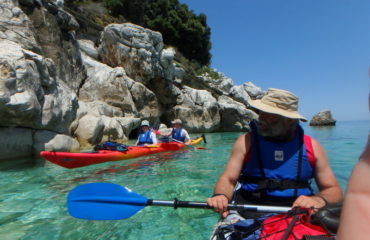 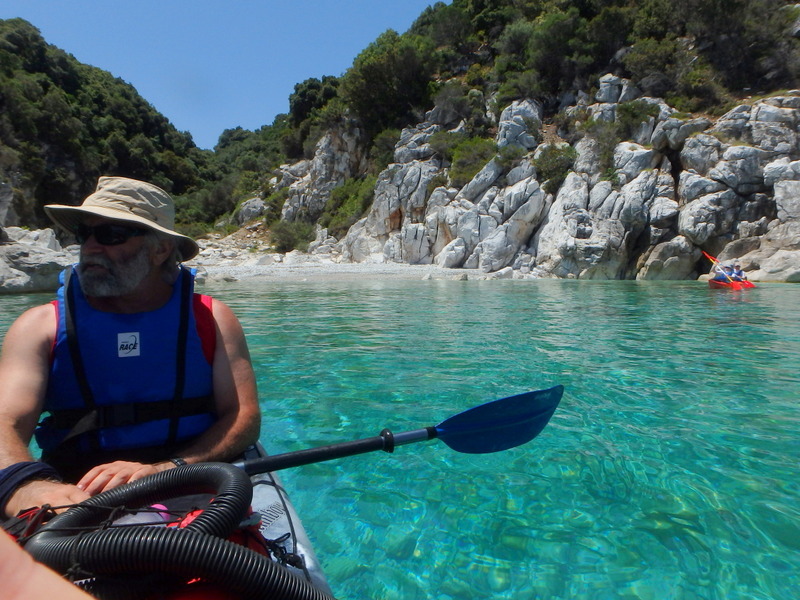 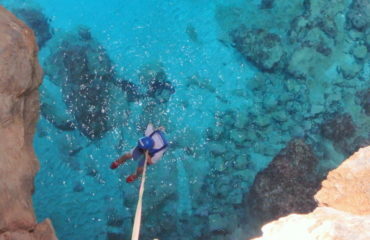 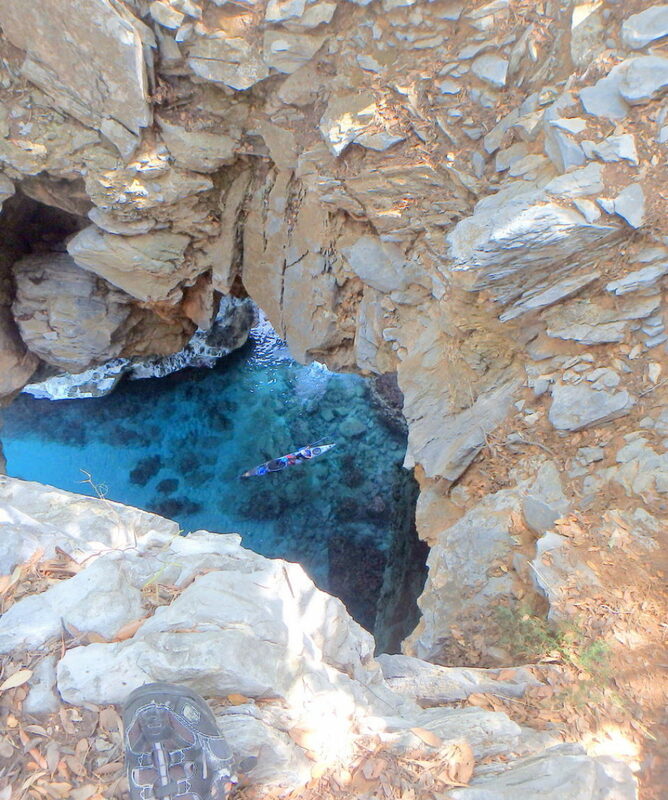 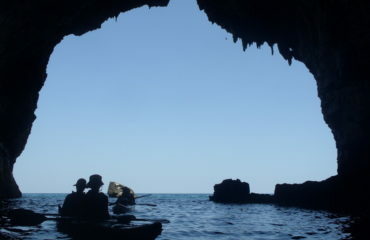 Sea Kayaking & Sea-cave abseiling along the Pileas caves coast in north Pelion. 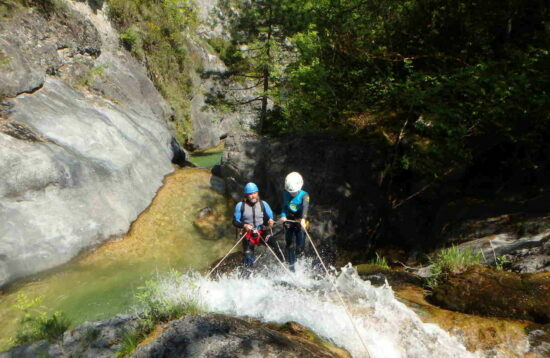 Meet in Veneton, our starting point for this activity. 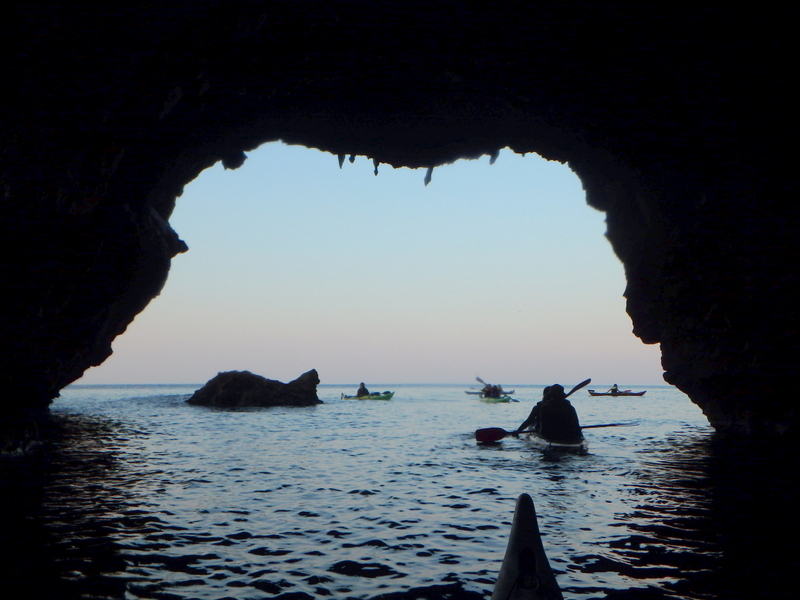 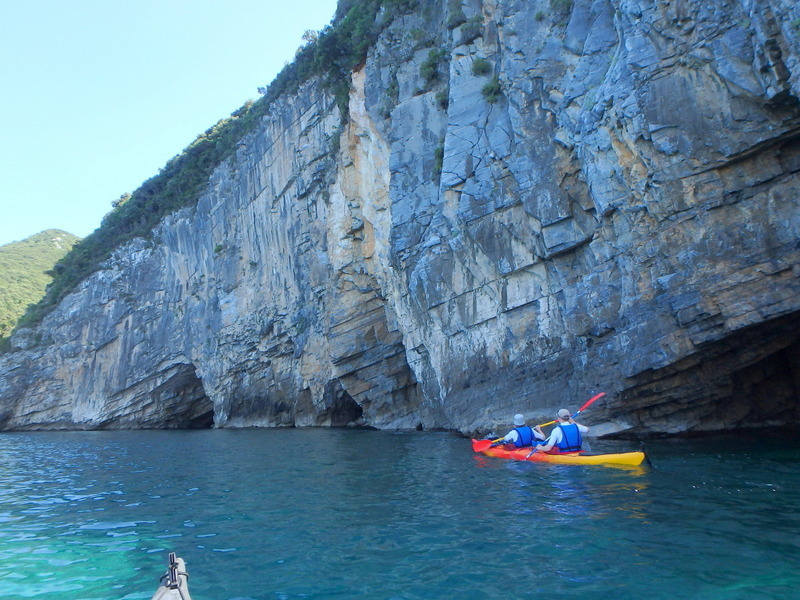 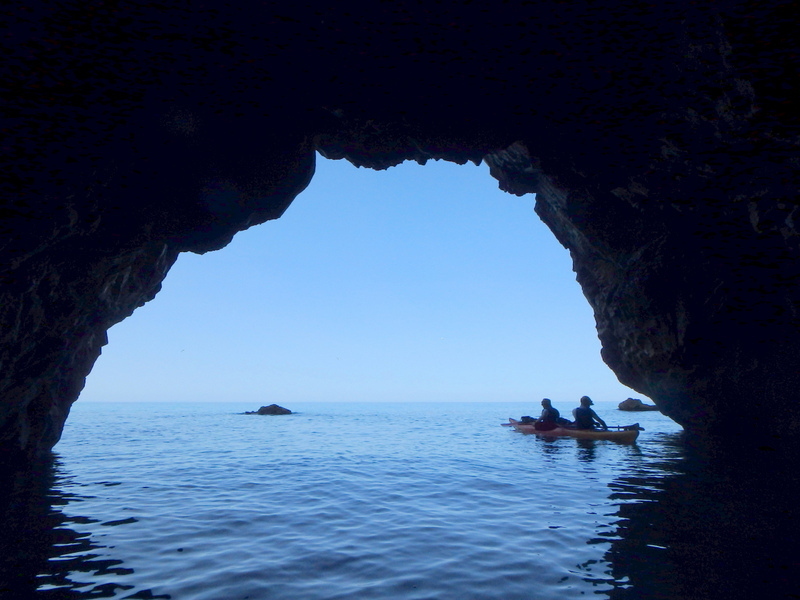 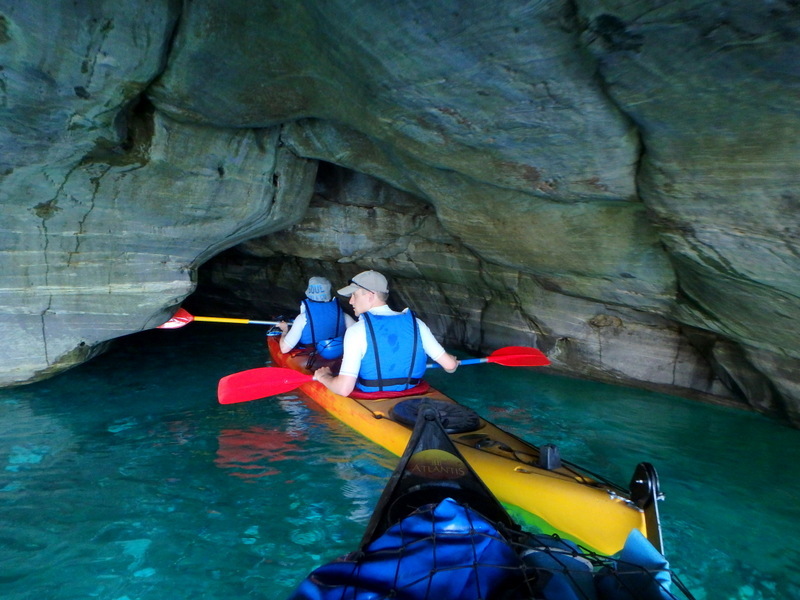 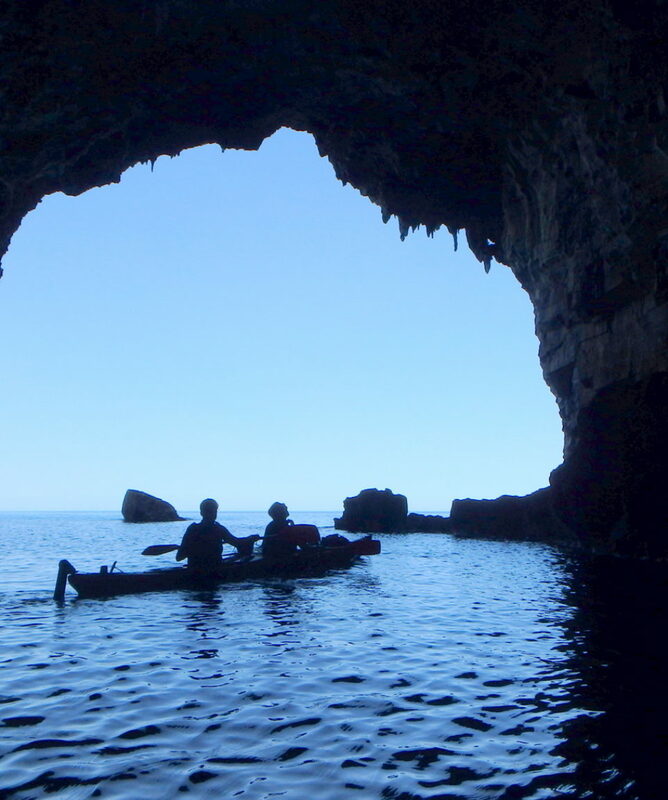 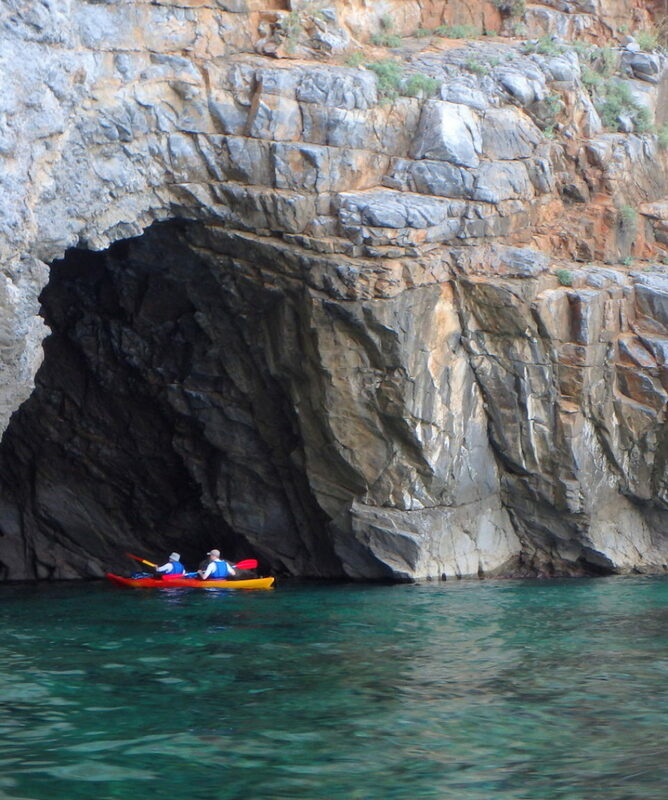 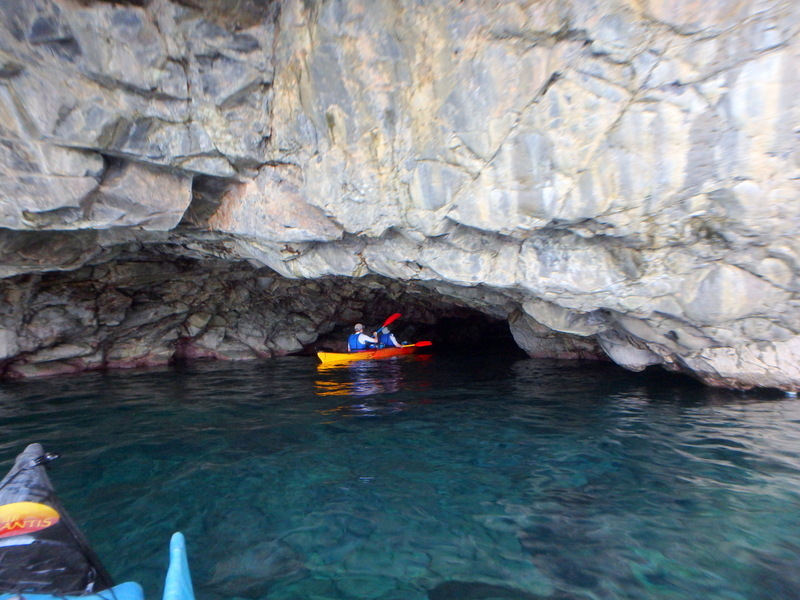 We explore in our kayaks the amazing Pileas sea caves of Veneton and swim in marvelous isolated beaches (this is described in “Sea Kayaking in Pileas caves route”). 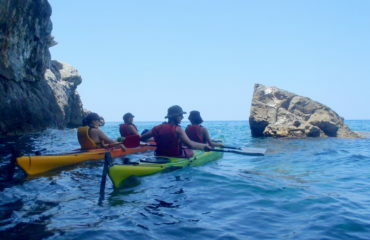 Along with the sea kayaking, for everyone who seeks even more adrenaline and unique adventure, this wonderful place still has the answer! 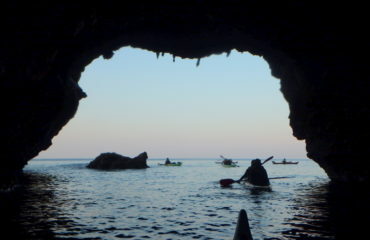 Just after we have started the sea kayaking ride, we stop in a little cove to gear up and after a 15’ walk along a path with fantastic views of the coast below us, we stand next to the big cave’s roof opening breathless as we look 35m down to the crystal clear water! 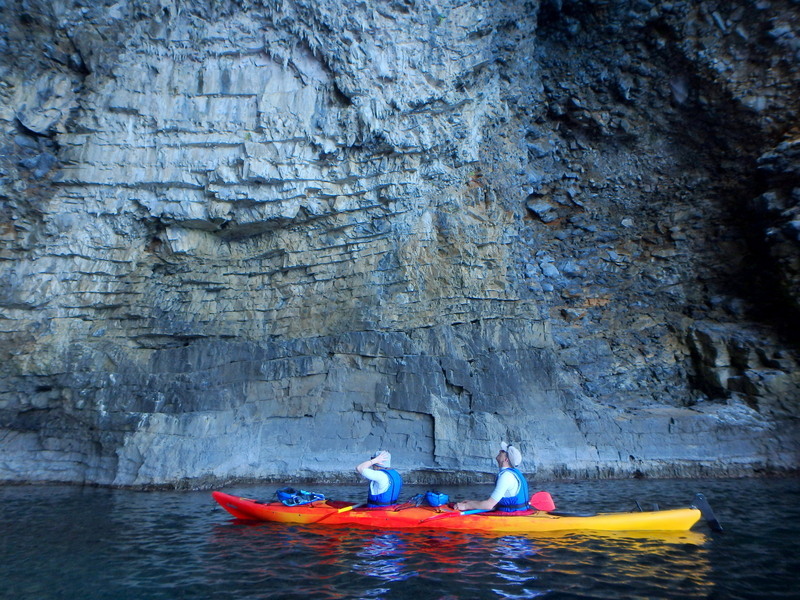 We experience a contact with another nature’s wonder! 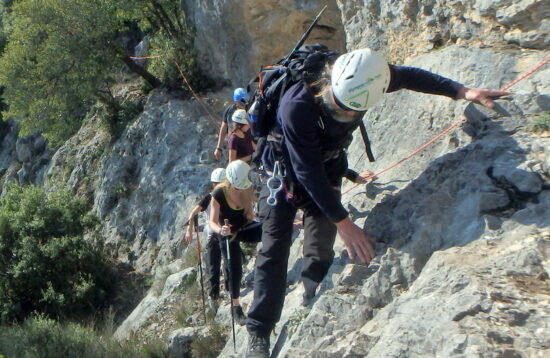 The guides prepare the ropes for the abseil and give the last minute directions. 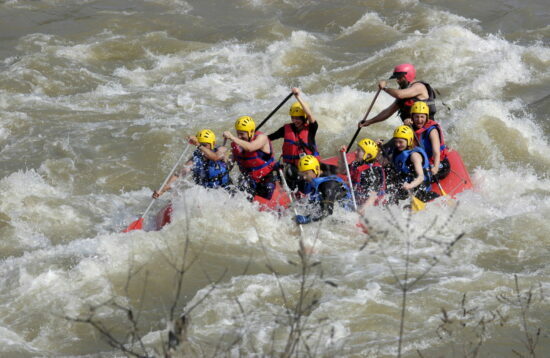 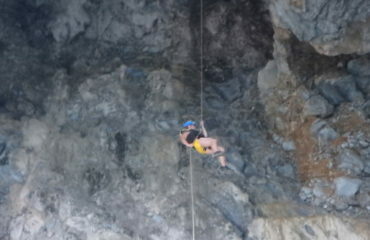 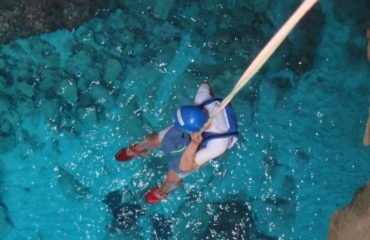 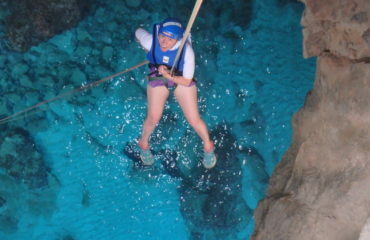 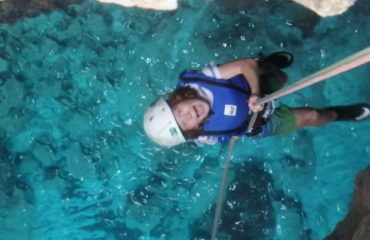 The adrenaline goes red, as we descend into space in a pandemonium of rock and watercolors and strong emotions! 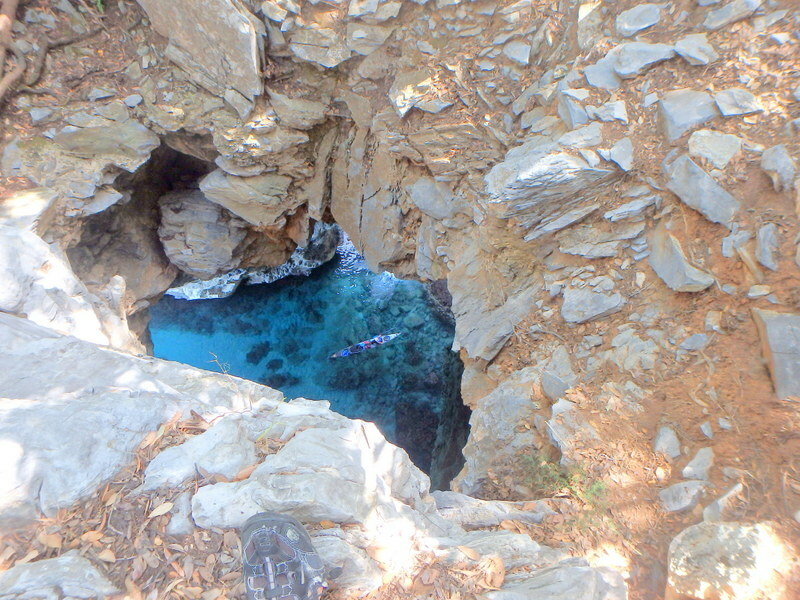 Swim and dive in the swimming pool-like water inside the cave, until everyone is down. 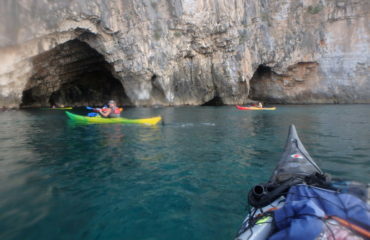 Then, we all swim out to another cave, through which, we get back to the path and our kayaks. 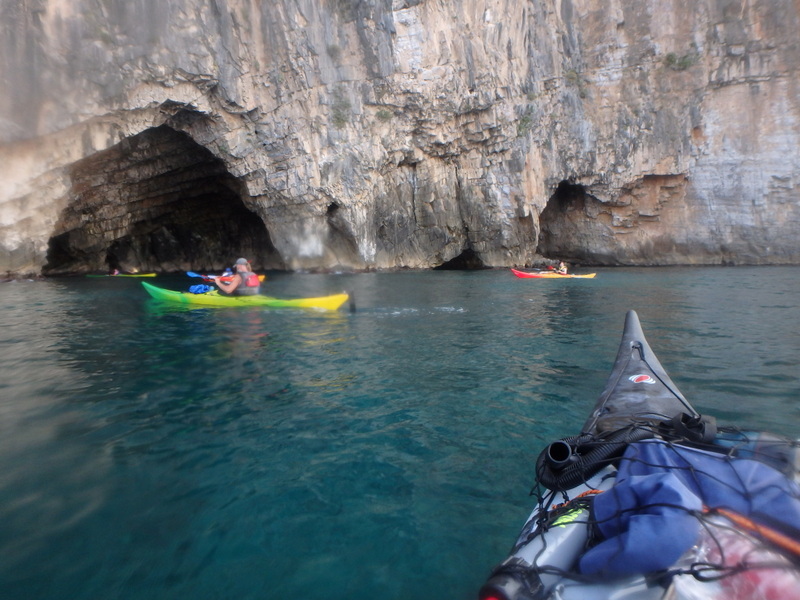 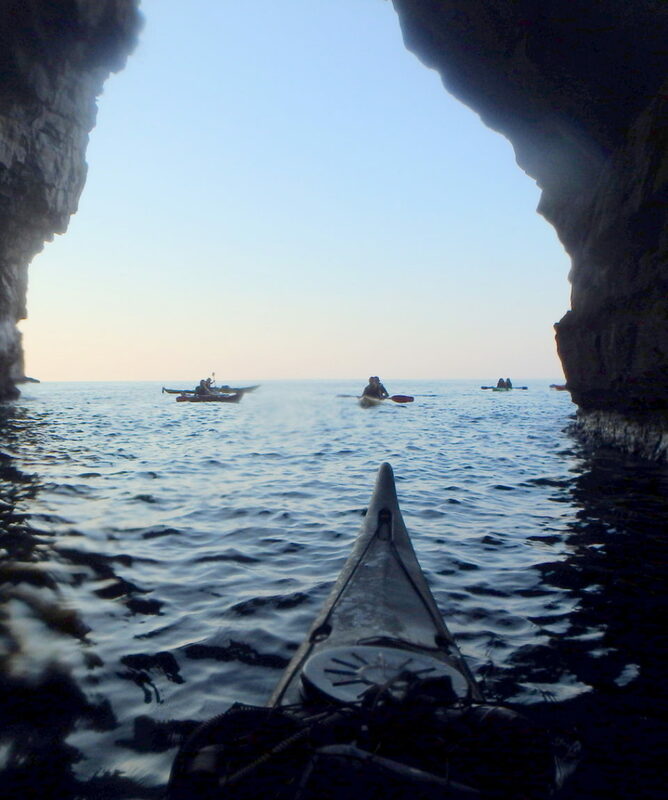 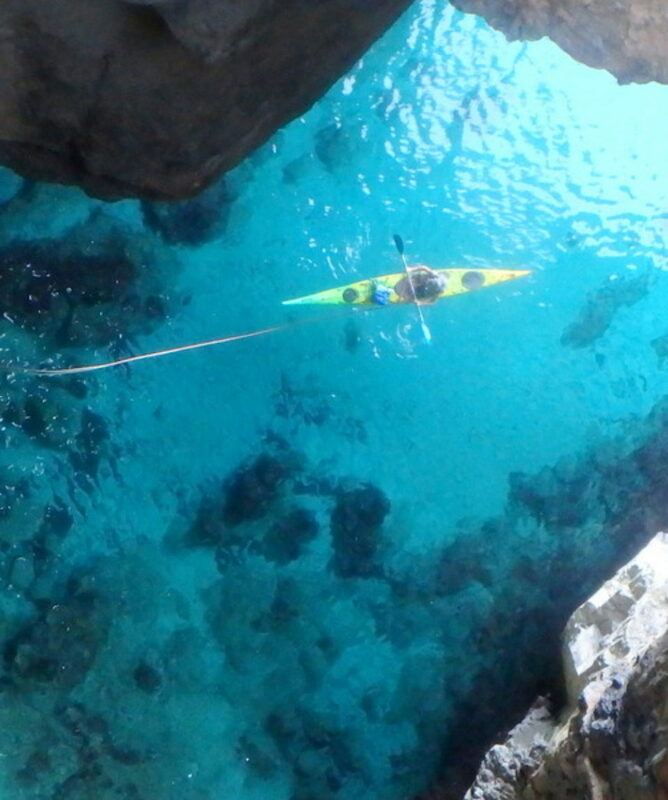 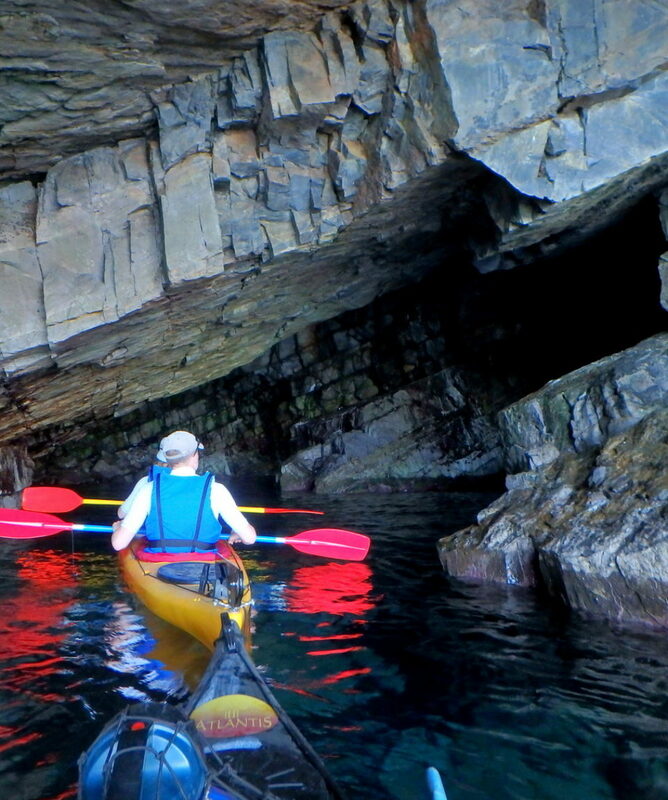 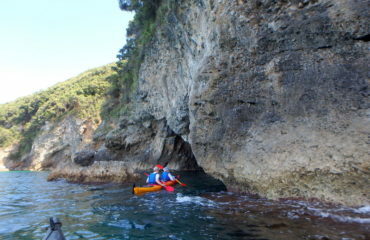 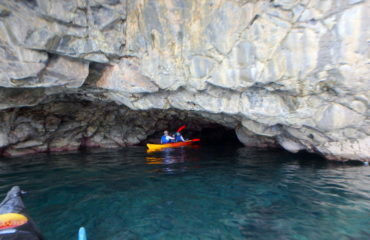 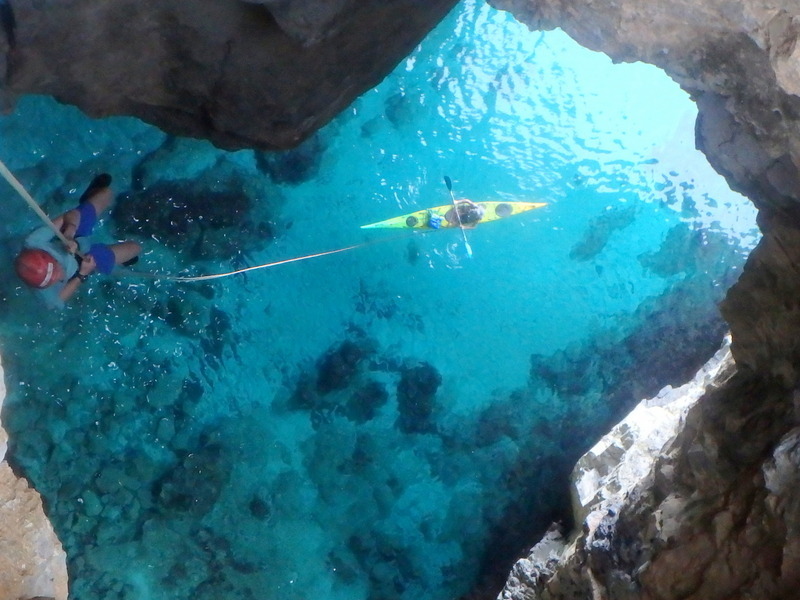 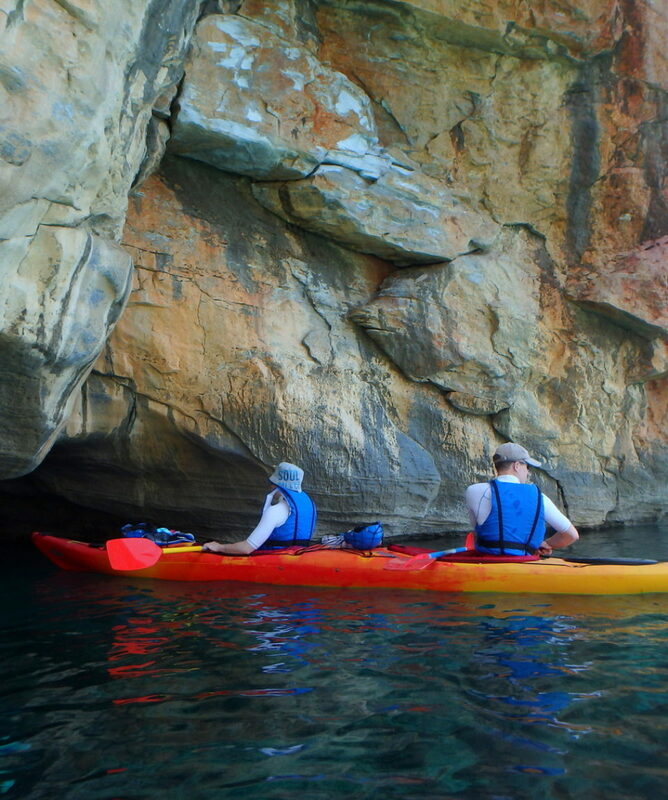 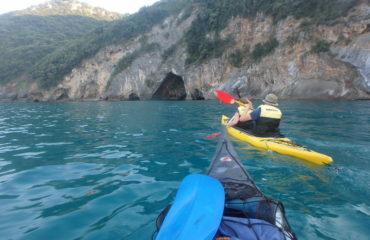 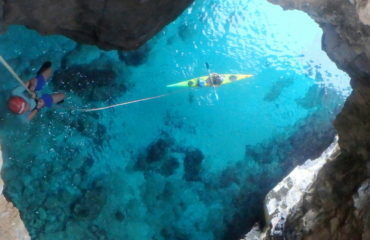 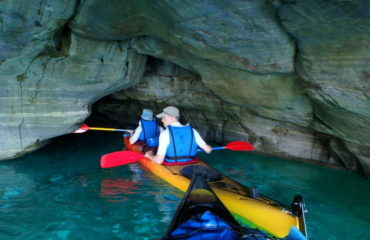 Embark to continue our sea kayaking journey and cave exploration. 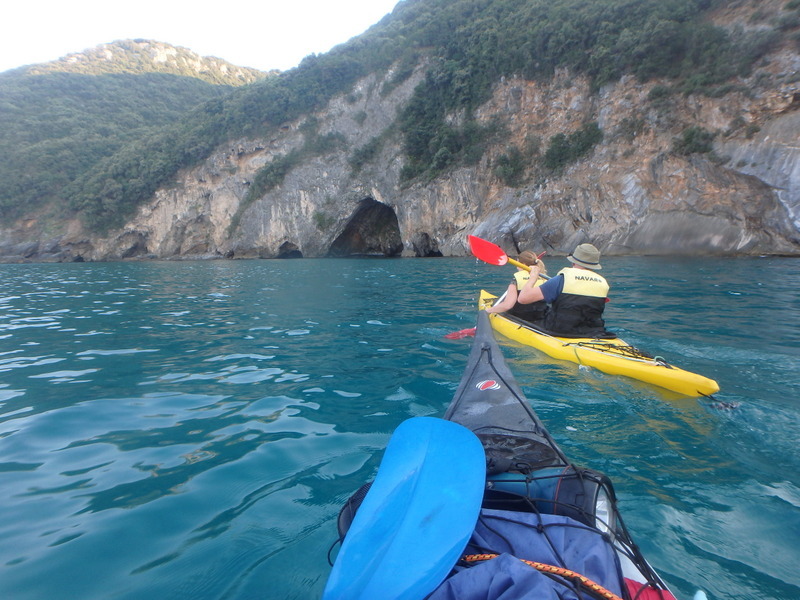 All the abseiling equipment (harness, helmet) is carried in the kayak’s storage compartment, with the rest of the gear and personal staff. 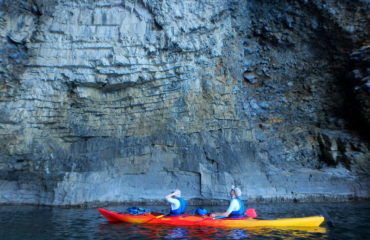 Paddling time 2.30’ hours. 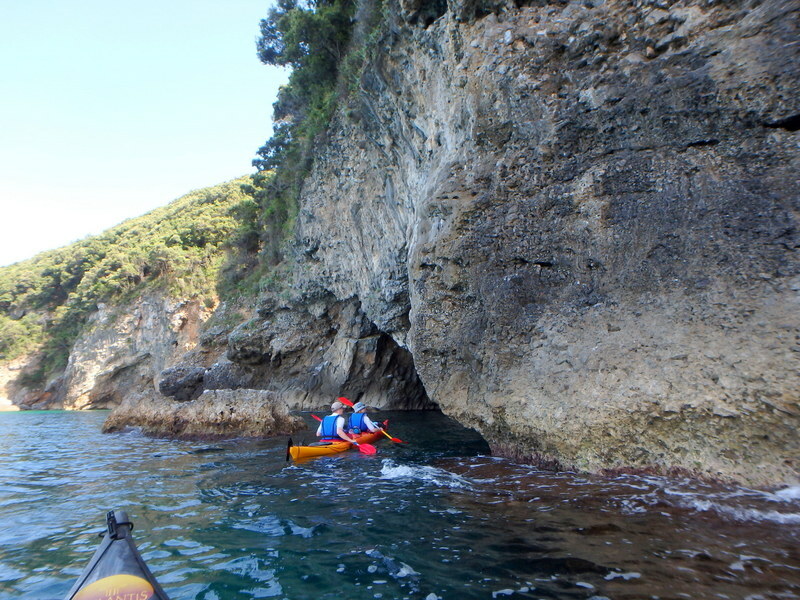 Total time: For this combined activity we have a very early start, as the total time from our meeting to the ready to return home time, can exceed the 8 hours.